If you aren’t familiar with Robert Kaplisnky’s Ms. Pacman, you may want to take a moment to read through the lesson. 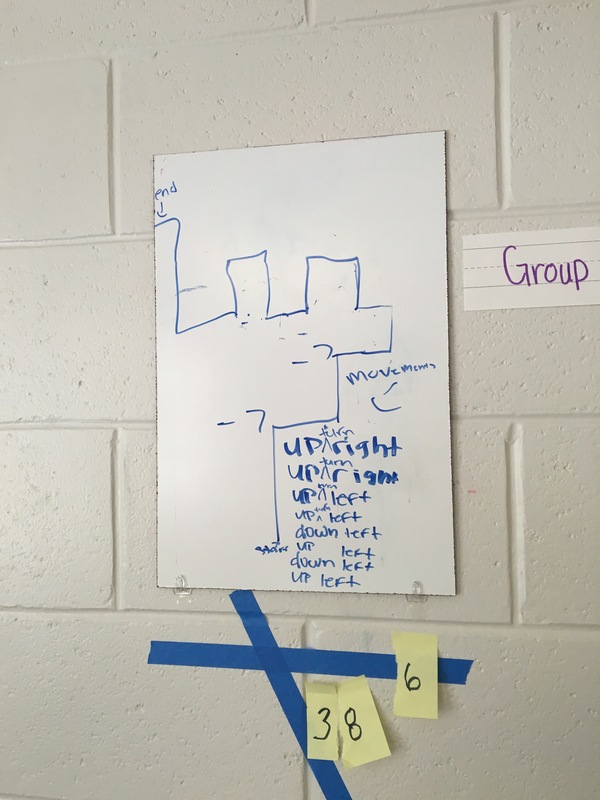 Before we began our math discussions about transformations, I had students work in their table groups at their vertical whiteboards to describe Ms. Pacman’s movements in the initial video. All but one group used terms such as slow or “in different directions” or right angles. When I inquired about their descriptions by asking, “how would you describe her movements other than slow” or 90 degree angles (to which I contributed our previous discussions about angles), only a few could produce directional movements. As they looked around at other groups descriptions, they erased what they had and wrote slow and in different directions. I quickly asked them to rerecord their original thinking and proceeded to ask about Ms. Pacman’s movement on each pathway drawn. To which they responded up, down, left or right. I called the rest of the class’ attention to this group’s thinking. Other groups imitated the pathway requesting to see the video again to ensure they were accurately drawing the path. This group described her horizontal movement as east and west and her vertical movement as north and south. After seeing the thinking of surrounding groups, they added more explanations to their board (pictured above). This group identified the right angles as places Ms. Pacman turned. We came back together as a whole group to discuss our layers of thinking. Layer 1: Identifying the movement. 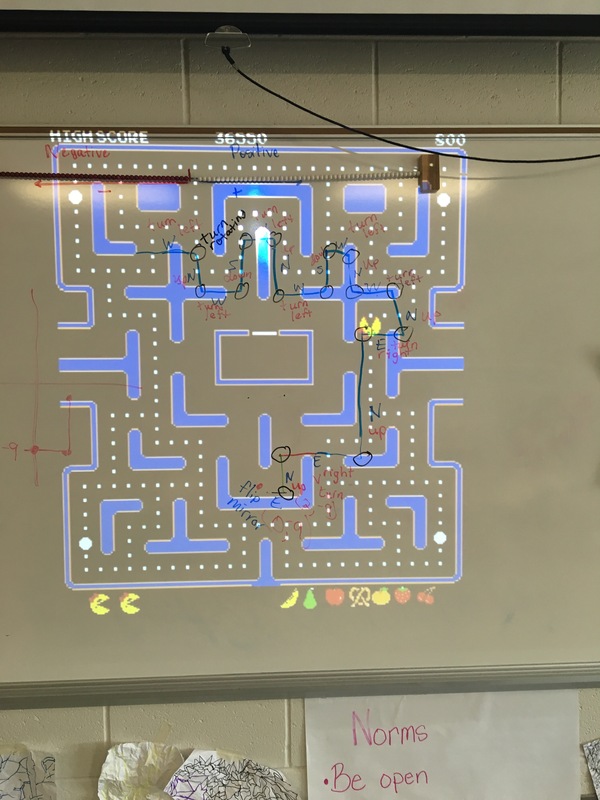 During a running of the video, a student (without my prompting) came to the board and traced the path used by Ms. Pacman. I called on the group who I first identified to label her movements by sliding right, left, up and down. We labeled the path with the initials of the direction she moved. I asked the group who used cardinal directions to share their thinking of the path. I asked the class if we could say right or east, left or west, up or north, down or south. They agreed so I labeled the path using the initials of the cardinal directions. We used this video to determine if we correctly identified her slides. Layer 2: identifying turns. I asked group 1 why they circled all of the right angles on their path. They explained the right angles are the places where she changed position. One of the group members asked if that was called a rotation, as she had learned about transformation in her Connections class. Someone else blurted out she was turning. We replayed the original video and students shouted turn each time she rounded a right angle. One student asked if she flipped instead of turned. Enter layer 3: We briefly discussed what it would look like if she had flipped instead of turned. One student offered the synonym mirrored. We replayed the video and concluded she flipped or mirrored once at the very beginning. 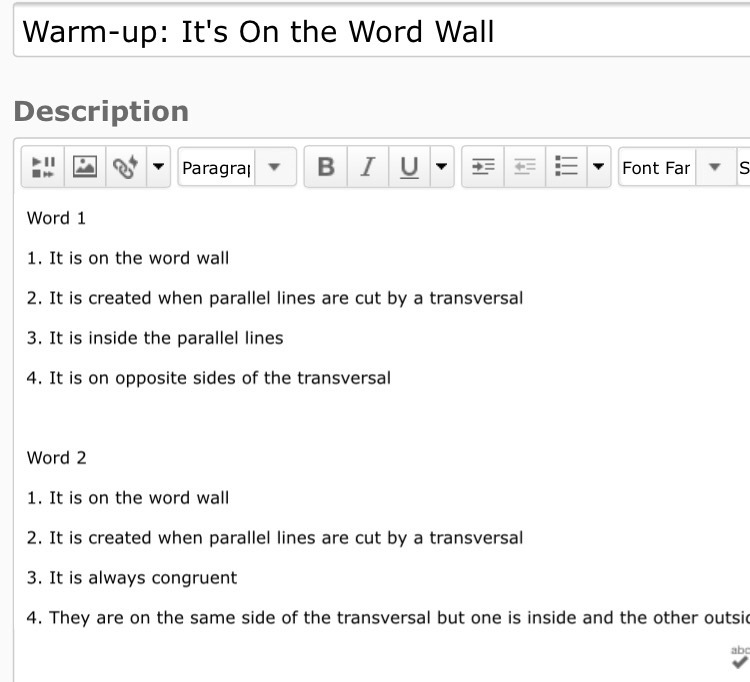 Layer 4: Summarizing. We summarized our lesson by putting our conclusions on an anchor chart. We discussed the moves or transformations made in order. I began by using the language the students stated in their explanations. Then I attached the formalize math language to each. For example, in recording the example of reflection, I drew a representation of Ms. Pacman flipped or mirrored and stated, “this is what we call a reflection”. Although dilation was not a part of this lessons, we extended our discussions by briefly connecting Pixels, an Adam Sandler movie where Pacman is enlarged or dilated. 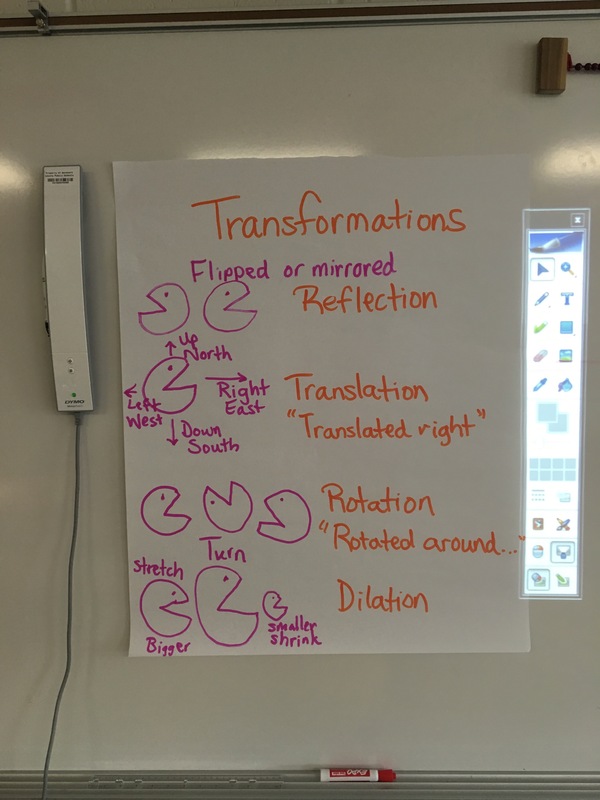 This anchor chart was hung in the room as a reference for math language and understanding of the four transformations based on this context. One of my goals this year has been to establish a context for learning at the beginning of each unit (or subunit). In my district, unit 2 for Introduction to Algebra is Transformations. My 8th grade team decided to start with angles, which changed my plan a bit. Did I panic and complain? Goodness no! (That was for all the Pete the Cat fans 😉). I went to Desmos and looked for a lesson on angles. Day one of angles we went to the computer lab to partake in Lines, Transversals and Angles, which was my students’ first experience with Desmos and mine with a large group of students. They were so engaged and engrossed in the activity it was difficult to slow them enough to discuss the overlays used to explain placement of dots to identify congruent angles. 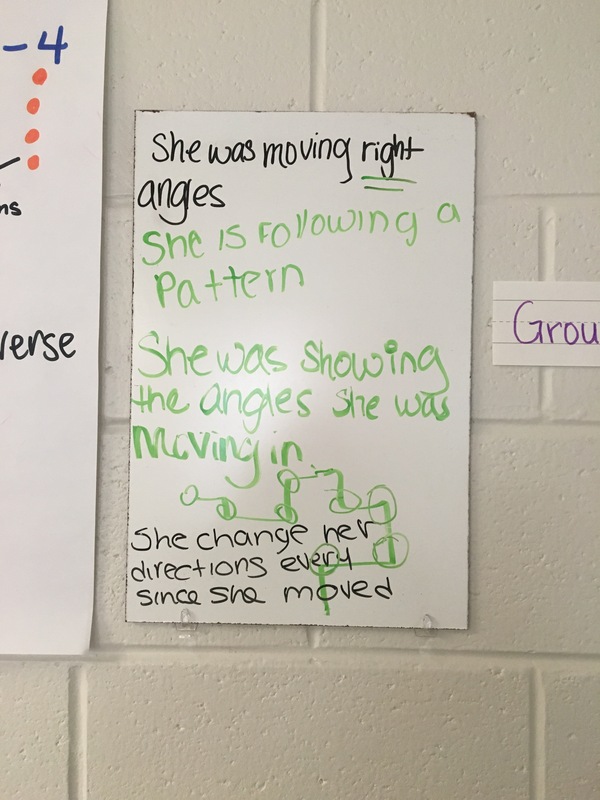 Over two days, students were able to make sense of angle relationships through the use of this activity and I had a Birdseye view of their thinking. I loved how the system captures the information for me to return to later. I used my formative assessment data collection sheet (not pictured) and recorded where individual students were based on the expectations of the learning target. After this bit of exploration, I conducted guided instruction focusing on the characteristics students identified during the investigation. This was a great springboard into the angles discussion going from identifying angle pairs to using their characteristics to find missing angle measures and will now lead us into triangle measures. 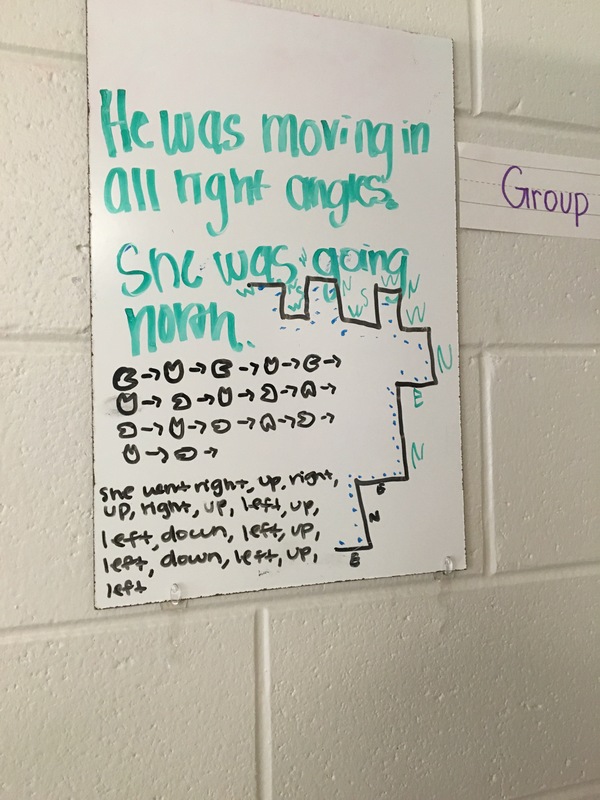 This subunit included activities such as Transversals, Tape and Stickies, Angle pair flash cards, a word wall game called It’s on the Word Wall, a project and a formative assessment using Plickers. As we transition to triangles, I wish I had taken the time to return to this Desmos lesson and compare what students know and understand after looking at these concepts in different ways. *It’s on the Word Wall rules can be found here. The second day of school we jumped head first into an investigation. Students were presented with this context. Within groups of four they worked on VNPS investigating each scenario. This was my first time using vertical non permanent surfaces, although I had been encouraged to use them a couple of years ago. 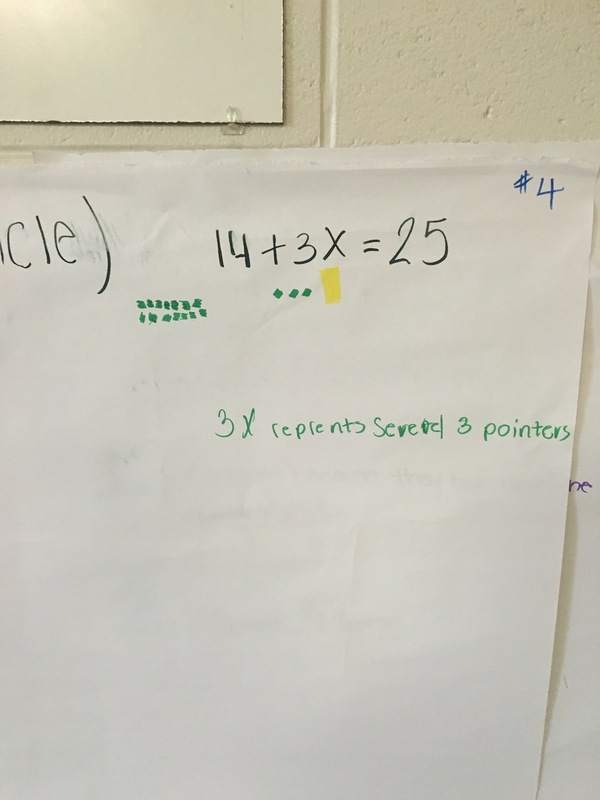 I loved the easy view it allowed me to have of student thinking. Walking around to converse with each group seemed easier. How students work in group settings. How students can use a context to make sense of a new concept. 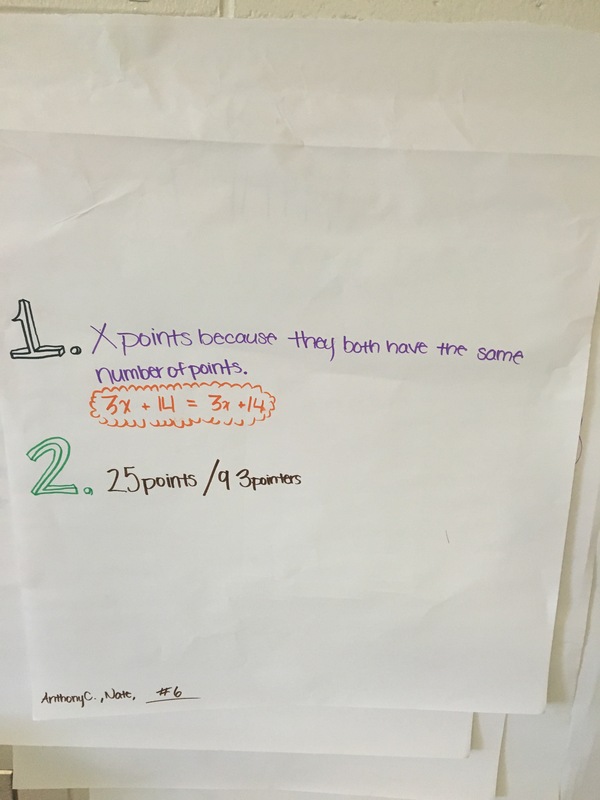 Students’ background knowledge of solving equations. Students’ ability to persevere when things are difficult. 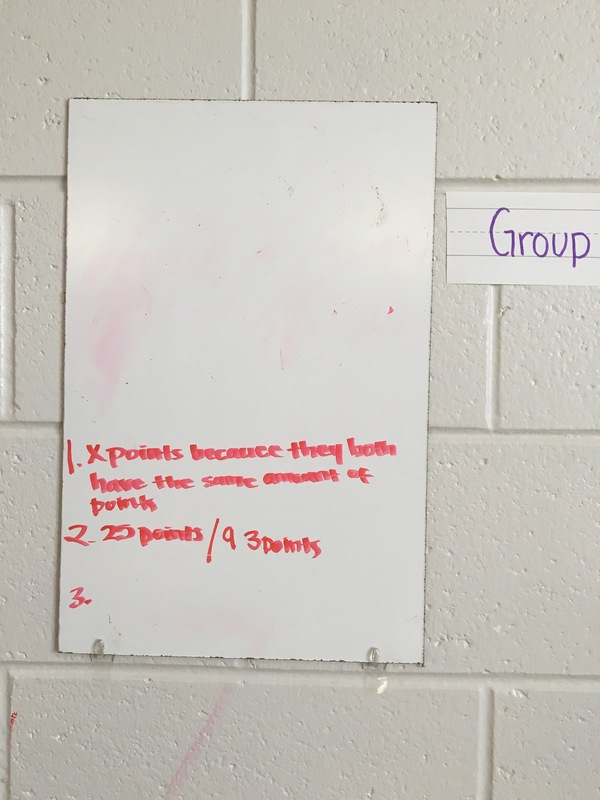 Can students write equations from a context. *Our first unit dealt with solving multi-step equations with special cases. Students were given access to Algebra Tiles and Algeblocks during the investigation. We discussed the conventional meaning of the blocks, which helped groups like this make sense of the quantities within the first scenario. While students worked, I observed their strategies and listened to their explanations. 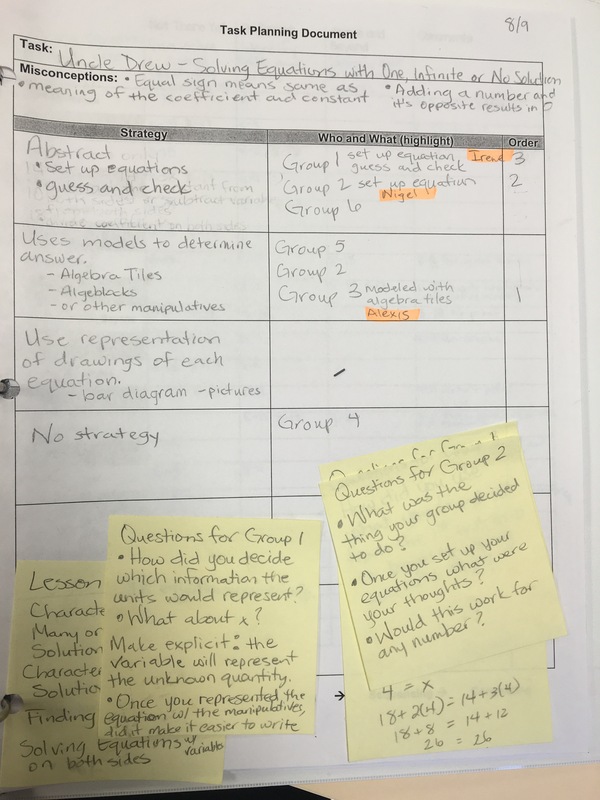 I used this monitoring sheet to identify which groups were thinking what way all the while considering in which order I would have them present during math congress. 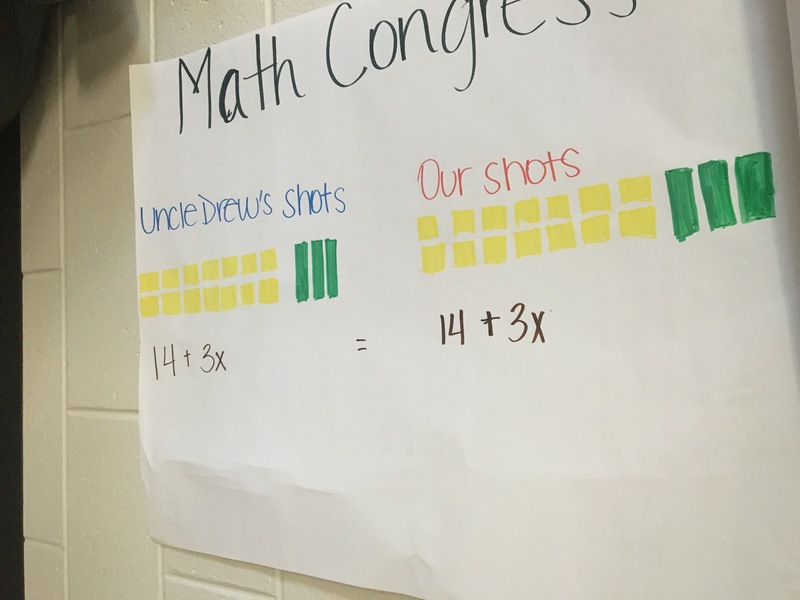 During math congress, 3 people representing 3 different groups shared their findings. This process hit some many realms of instruction, formative assessment (like an informal pretest), use of manipulatives, SMPs (especially 1, 2 and 3), peer corrections, writing equations from real-world situations and solving equations with special cases. The lesson took 2 days, one full day of investigation and preparing for math congress and the second for math congress and focused instruction. 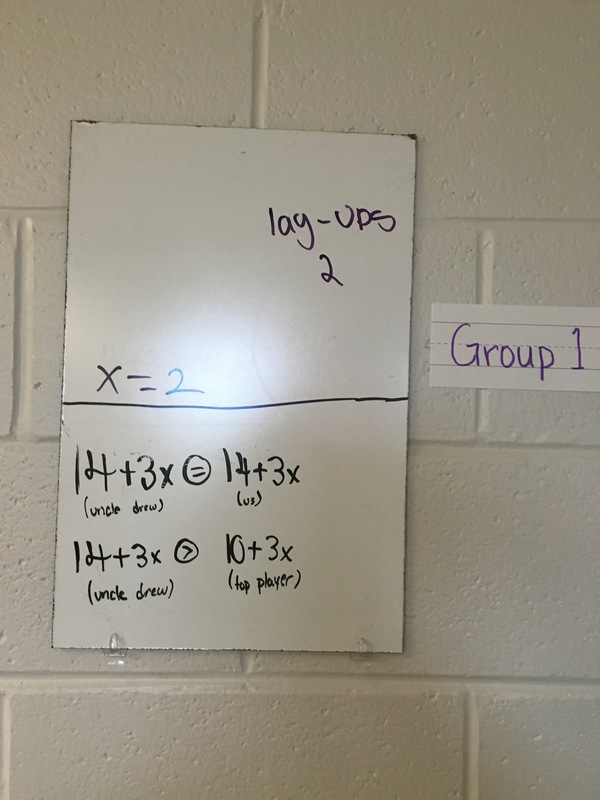 On that second day, I used the students’ findings to lead focused instruction on equations with special cases. The use of the context helped it make sense to students and gave the procedure for solving equations a purpose. I was able to provide formal vocabulary such as one solution, no solution and infinite solutions based on students findings. 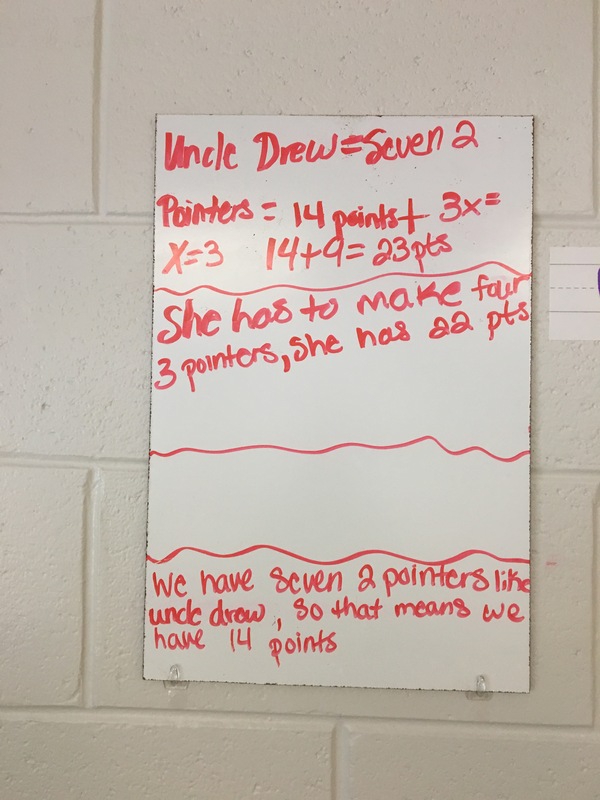 Throughout the rest of the unit, we were able to always connect our thinking back to Uncle Drew’s points and “our” points. The two posters above were not shared during math congress.